The Octagon hosted its first flyweight championship affair on Saturday. If you opted not to shell out $54.95 to watch UFC 152, no worries because we’ve located the video highlight of Demetrious Johnson vs. Joseph Benavidez for your viewing pleasure. As expected, their 125-pound shootout offered non-stop, fast-paced action. After 25 back-and-forth minutes, Johnson managed to leave Canada as the promotion’s inaugural flyweight king by taking a split decision victory. While there was some controversy surrounding the verdict, the proof was in Benavidez’s pudding. 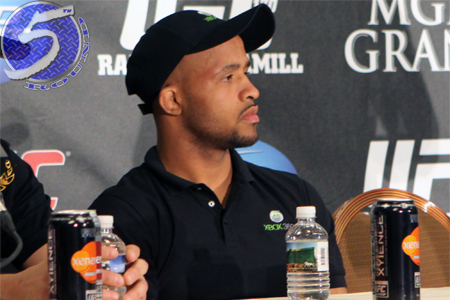 He appeared at the post-fight press conference battered and bruised, while Johnson’s face escaped unscathed. UFC 152 took place Saturday inside Air Canada Centre in Toronto.